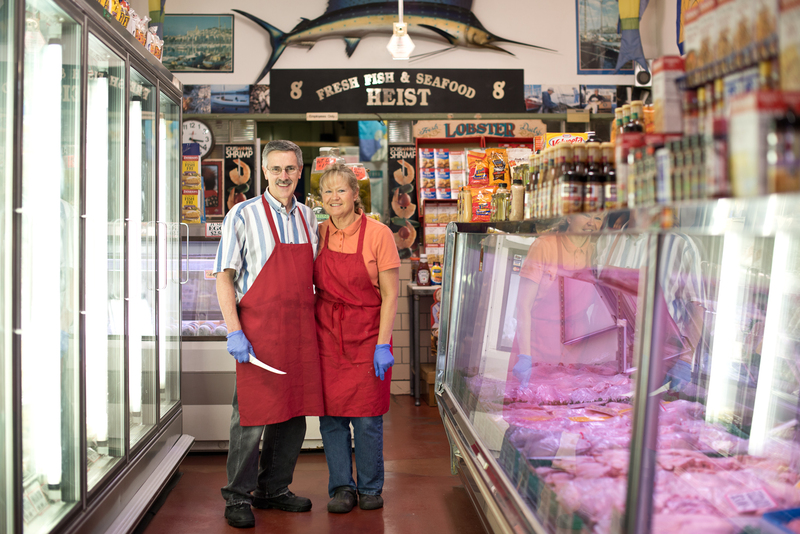 Tim and his wife Barb own Heist Fish and Poultry, where the family has operated the business since 1934. There's been a Heist store at Findlay Market since 1931, but the business itself dates back to 1880 when Tim's great-grandfather, Adam Heist, sold poultry out of a horse-drawn wagon in Covington, Kentucky. Today, Tim and Barb's children are generation number five working in the family business. 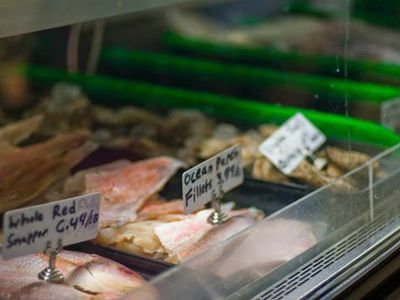 Heist Fish and Poultry offers both fresh and frozen seafood and poultry products. Their shipments of fresh seafood arrive daily. The number of specialty products offered by the Heists includes prime fillet alligator, frog legs, crawfish, squid, pheasant, quail, and duck. They're happy to special order anything that's not in stock. The freezer section is loaded with dozens of familiar favorites like breaded chicken patties and nuggets, hush puppies, clam strips, egg rolls, pizza, crab legs, scallops, French fries, potato wedges, and tater tots. You'll even find "starfish" (they're actually star-shaped breaded fish nuggets). Heist Fish and Poultry sells fresh Amish chicken, free of preservatives, and a variety of smoked foods, like turkey parts and salmon. Poster-size photographs from the early 1900's line the walls of this store, illustrating the history of the business and the family as only pictures can do. There's one of Adam Heist next to his poultry wagon. Another picture, taken a few years later, shows an early automobile bearing the family business name with Tim's grandfather, Elmer, at the wheel. In another picture, a three-year-old boy holds a basket of eggs. The boy is Tim's dad, Ray, and the year was 1919. Ray Heist eventually had twelve children of his own. Tim is number eleven. When Ray transferred ownership of the business to Tim in 1982, the only thing that changed was the wording of some paperwork. Tim had grown up with the business, and Ray wouldn't retire for another fifteen years, at age 81. In May 2002, Ray died at age 86. People are still sharing special memories of him with the Heists. That's because the family has earned a loyal customer base, sometimes going back three and four generations. Barb remembers the day when five generations of a single family of customers was in the store all at once. If she had had a camera, she would have taken a picture and hung it on the wall. 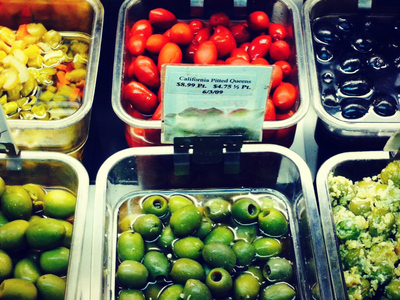 Heist Fish and Poultry is a place where everybody watches each other grow up - on both sides of the counter.